The council has been debating the budget for months and finally settled on a $3.7 billion budget for city services for next year. It will increase the average Austin resident’s tax bill by $87 over the next year. The new fiscal year begins October 1st. 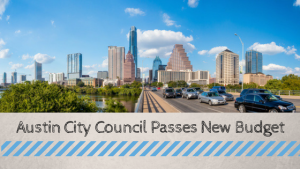 Increases include a 2 percent pay raise for city employees and the addition of a citywide curbside composting program. The program will cost the city $4.2 million and Austinites a cost of $64.80, which will be phased in after two years. Homelessness was another priority, and $600,000 was put in the budget to help with that. $475,000 was earmarked to help keep live music venues open and $400,000 was put towards extending healthy food options. The fees for most city services will increase. Average water costs will increase $35 annually, but average electricity costs will go down $44 annually. While the property tax rate decreased, from 45.89 cents per $100 of property valuation to 44.18 cents, and the homestead exemption will increase from 6 to 8 percent, most homeowners will still see their tax bill go up because of rising property values. The average homeowner will see a $46 increase in their property tax bill. These tax bills are passed along to renters in the form of increased monthly rent. Not all Austin City Council members were on board with the new budget, however. Council members Don Zimmerman, the notorious conservative of the group who votes against any expanded city services or increased taxes, voted no as did Sherri Gallo. They both said they couldn’t support the additional tax burden on Austin citizens. Ellen Troxclair was out because she recently had a baby, but she wrote a letter voicing her opposition. Ora Houston voted for the budget, but abstained from the votes about increasing the tax rate to pay for it. The council cut staff’s budget by putting off filling several positions, delaying a data center relocation, getting rid of the funding for a technology survey that was to go out to residents, and cutting down the expansion of getting third-parties to review building inspections and other items. The council debated several other measures that didn’t pass, including using $575,000 from Austin Energy’s capital budget to fund increased lighting at some parks, and a proposal to keep local utilities from raising rates. The council was also deeply divided over the homestead exemption for seniors and disabled Austin residents. In the end, the exemption remained at the same level as it was in 2016. The new budget comes shortly after the council approved a $720 million mobility bond. Austin is getting more expensive every day, but Austin Apartments Now can help you find an apartment that fits your budget and lifestyle. Give us a call today at 512-258-8224 for the latest in rent, vacancies, and move-in specials.